And thus continues our illustrious Month of Jane. In case you are just joining us, here on this little book reviewing blog the month of June is devoted to the great Jane Austen. No, not the books of Miss Jane, but rather how modern day authors have chosen to take a spin on the life and work of the daughter of a country clergyman turned famed author. Well, now she is known as a famed author. Her fame during her life time is questionable. But either way, there are certainly countless books released just in the past decade about the life of Jane Austen and who she really was. Was she a feminist? Was she a want-to-be missionary? Was she a spinster by choice? Was she really a good writer? We can of course ask these questions all day long and perhaps, for the worse it always seems, come up with our own answers. I find there is a lot of speculation about Jane lately, much of which appears to come from people who want to be the ones to say they have defined Jane in a previously undiscovered light. Then in the end it always turns out sounding silly and frequently unfounded. So, how, in this world of voices, does one really get to know Austen? Well, why don’t we go straight to Jane? In the days prior to phones, texting, and Facebook (I know it’s hard to believe, but such times did exist) hand written letters were the only way people living apart from each other had to communicate. In fact, much of history, from the roots of the American Revolution to the heredity of kings and queens, is traced through personal letters discovered over the years. Jane was no different. One of her most famous lines is, “Those who write long letters with ease, cannot write ill.” So along came an author by the name of Penelope Hughes-Hallet, who collected all of Jane’s letters and put them together under the title of My Dear Cassandra. Cassandra Austen was Jane’s beloved elder sister and dearest friends. Whenever the two were separated Jane could not go very long without writing her sister letters describing everything that she had seen and done and, more importantly, what her opinions were. 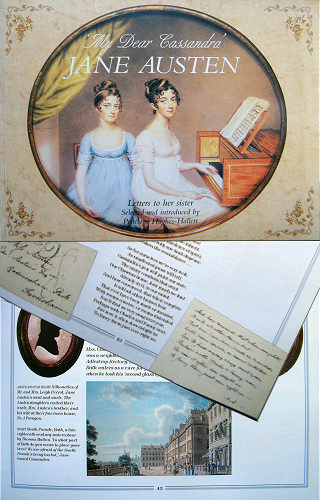 The book is chronological in order, starting with snippets from school lessons Jane wrote out to please her education minded father and studded with facts about the Austen family structure and the physical circumstances of Regency England. Throughout the course of book you easy grow to understand Jane’s views on life, her surroundings, and the influences that brought five of history’s most well known novels into to existence. As one might expect after reading her work, she is often sweet and innocent in one way and a little snarky and mischievous in another. One of my favorite lines in the book (paraphrased because I do not have a copy with me right now) is: My dear Cassandra, I am so happy to hear Mrs. (Something-or-Other) liked the hat I was wearing the last time we met. I am not happy to hear, however, that you gave her the pattern so she could make it for herself! Of course, the letters of Jane Austen are not without controversy. Shortly after Jane’s premature death, Cassandra sorted through all of Jane’s letters and promptly burned the ones she felt were the most private, leaving us with gaping holes in some of the most formative events in Jane’s life. The book speculates about certain events, but everyone agrees that there are some things we will never know…Thanks a lot, Cassandra!! So there it is. If you’re clouded in the ideas and images of Jane Austen, or simply wish to know her better, I highly recommend going straight to the source. Have I mentioned that the book is full of illustrations from the time period including some of Cassandra’s drawings? Well, it is. Do you ever get frustrated with modern day “scholars” trying to rediscover classic authors to suit they own belief systems? I’ve already warned all of my family (on pain of death!) that if, upon my death, they do not burn any and all surviving journals (though I’m fairly certain that my faithful journals would not choose to go on living when I myself had deceased – and so I believe it quite possible that they would simply die quietly somewhere and bury themselves) anyway… as I was saying, IF they had the audacity to try and keep any my journals (horror) and read them (double horror) or give them to friends or relatives to read (quatrinkle horror) or PUBLISH them (death by horror) I would never be able to recover and no doubt would eventually die from the shock (and horror) of it all. P.S. (This is an important P.S.) Just so you know: My journals do not contain any of the following… revelations of a secret lives I live on the secret that aren’t revealed, hate mail, etc. etc. etc.